Sean Dolan’s hopes of a Junior Championship upset disappeared inside 60 first half seconds at Celtic Park on Sunday night. The Creggan club, who were without Ciaran Wilkinson and a host of others, had belied pre-match predictions with an opening half hour that saw them dominate a wasteful Glack 15. Dolan’s recovered from the early concession of two points to hit 1-4 without reply with Sean O’Donnell and Darren Logue excellent. The game changed, though, in first half stoppage time. With Dolan’s three points to the good at 1-04 to 0-4, Kevin Nixon was pushed in the back by Ciaran O’Brien and Alan Nash signalled a penalty. Up stepped Oran Cassidy from full-back with the opportunity to send his side into the break six points to the good. His spot-kick was well enough hit but at that nice height for Glack keeper James McLaughlin who dived to his left to turn the shot away. Glack broke at pace with the city side still reeling from the miss. A sweeping move eventually found Jimmy O’Connor breaking the Dolan’s defensive line at pace to go through on Dave McGilloway. The Dolan’s keeper produced a fantastic save but the ball fell kindly to Ryan Morgan who was having the type of game Dolan’s didn’t want him to have. The O’Connor’s forward steadied himself and sent a low finish under a crowd of players to level at 1-4 a-piece as the side went in at half-time. And put simply, Dolan’s never recovered from the six-point swing. It would be 22 second half minutes before they eventually worked the Celtic Park scoreboard again with Glack having by then moved to 3-06 courtesy of a Barry Kerr penalty - which also saw a black card for the influential Joe Gallagher - and Morgan, the game’s best player. The Creggan side set up with Ryan Watkins providing the cover for the full-backs while Barry Kerr fulfilled a similar role for the O’Connors but both sides looked very susceptible under any high ball played toward the goalmouth. Cormac Boyle had already pointed by the time he touched a high centre inches the wrong side of the post on two minutes with Morgan then doubling the Glack lead. Back came Dolan’s though Logue and an O’Connell free before a second high ball caused more havoc, this time in the Glack area. O’Connell was shooting for a point but when his effort dropped short, it was broken down to Gearoid McDermot who finished superbly to put his side three up at 1-2 to 0-2. Connor McCosker and Nixon extended the lead to five before Boyle again got on the end of a long ball but this time his touch took it inches over the bar with McGilloway committed. Moragn hit a brilliant left footed point on 25 minutes before that game changing end to the half. It remained close in the early stages of the second half until the Glack penalty knocked the heart out of Dolan’s but referee Alan Nash was left with little choice. Glack midfielder Liam O’Brien made a brilliant break, going clear on goal and was about to shoot when Gallagher, who had chased him down, made a last ditch effort to put him off his shot. It was slightly over zealous and sent him to the floor and the loss of Gallagher who had been one of Dolan’s best performers, was probably just as crucial as Kerr’s emphatic spot-kick. From there to the end, it became the Ryan Morgan show. The Glack forward popped up all over the pitch, knitting play together and taking scores on his way to a personal tally of 2-04, only one of which was from a penalty. Another superb McGilloway save prevented O’Brien from grabbing a third goal, the Dolan’s keeper getting enough on his block to see the ball trickle against the post and scrambled clear but it was a goal that was coming and duly arrived on 49 minutes through Morgan. The Glack playmaker was afforded far too much room by the tiring Dolan’s defence and simply ran away from them into space on the left hand side. It was debatable if Morgan was shooting for goal but such was the delightful trajectory of his finish that it deserved the benefit of the doubt. 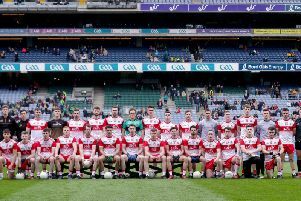 Derry Junior football’s toughest test awaits in the form of Faughanvale for the semi-finals and after victories over Ardmore and now Dolan’s, you sense that only then will we know how serious this Glack Championship challenge is.